Security Concerns Overshadow U.S.-Mexico Border Park Plan After more than 70 years, a project to create an international peace park between Texas and Mexico is slowly moving forward. Last month, Presidents Obama and Calderon signed a joint statement pledging both countries' interest in protecting cross-border wild lands. But concerns over border security overshadow the project. 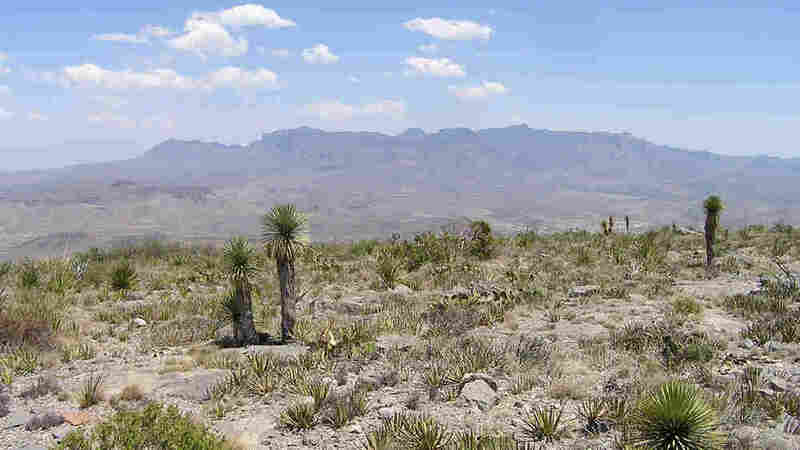 The Chisos Mountains in Brewster County near Big Bend National Park, in 2006. After more than 70 years, a project to create an international peace park between Texas and Mexico is slowly moving forward. Last month, Presidents Obama and Calderon signed a joint statement pledging both countries' interest in protecting cross-border wild lands. But worries over border security overshadow the project. When Big Bend National Park was established in 1944 in far West Texas, President Franklin Roosevelt wrote to President Manuel Avila Camacho of Mexico, "I do not believe this undertaking in the Big Bend will be complete until the entire park area ... on both sides of the Rio Grande, forms one great international park." Presently, this is as close as you can get: On the U.S. bank of the Rio Grande, at the entrance to Boquillas Canyon, a border busker from Mexico floats in a canoe on the river, singing for tips. His natural amphitheater is the great limestone canyon that interrupts the thorny expanse of the Chihuahuan Desert, creating one of the most breathtaking landscapes in North America. Mike Long, who runs an outfitter called Desert Sports, says the mountains are even more spectacular on the Mexican side. "They're every bit as beautiful as the Chisos Mountains in the BBNP. Actually, Mexico probably has an opportunity for a more spectacular park than what we have already here in the U.S.," Long says. Visitors to the Mexican side describe Douglas firs and ponderosa pines at 10,000 feet, crystal mountain streams, black bears and bighorn sheep. And it's untouched, far from paved roads, visited by the occasional sheepherder and biologist. As of last year, Mexico had set aside 2.5 million acres of wild lands on its side of the Rio Grande. 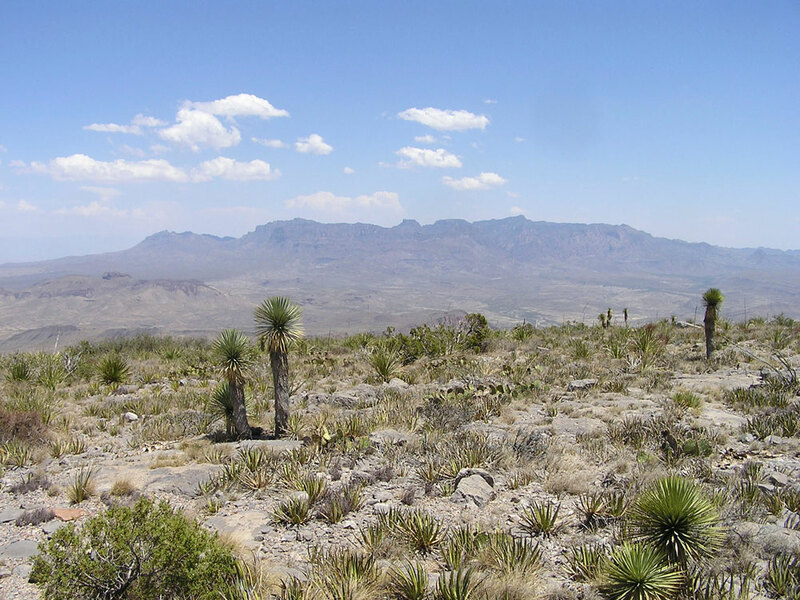 Together with Big Bend National Park and Big Bend Ranch State Park, this could become the greatest protected desert ecosystem on the continent. And there is a model, says Suzanne Dixon, Texas director of the National Parks Conservation Association. "We've got one here in America -- it's the Glacier-Waterton with Canada. That's been there; it's been working for many, many years. So this is not something new; this is something that exists," Dixon says. The Waterton-Glacier International Peace Park -- on the Montana-Alberta border -- has been in existence since 1932. There are three passport-controlled ports of entry. The two parks share visitors, wildlife management and fire protection. If they can do it on the Northern border, they can do it on the Southern border, says Rick Lobello, a conservationist in El Paso who is a longtime promoter of a U.S.-Mexico peace park. "It's just a matter of the two countries getting together and saying let's do this and come up with a plan, and then we'll work on the security issues, we'll work on the border crossing issues," Lobello says. And there will be issues. Brewster County Sheriff Ronnie Dodson, whose vast county -- bigger than Delaware and Rhode Island combined -- includes the Big Bend, says if there was a park in Mexico, he'd stay on his side of the river. "I definitely wouldn't go over there," he says. He's leery of Mexican drug traffickers. But international park supporters insist that the area is relatively safe. They point out that the Big Bend region has less illegal activity than many other areas along the 2,000-mile border. But Dodson disputes that idea. "Within a month, between us and Border Patrol, we've caught 6,000 pounds of marijuana coming out of there [and] numerous illegal aliens. The problem is when people say we're the least, it's because we're the biggest -- and we miss a lot," he says. Security is on the rise up and down the border. President Obama is sending up to 1,200 National Guard troops to the Southern frontier, though the governors of Arizona and Texas say they want more. The National Park Service has had to shut down access to the Arizona-Mexico border areas inside Organ Pipe Cactus National Monument. Eight houses are now under construction for Border Patrol agents to live in Big Bend National Park. U.S. Rep. Ciro Rodriguez (D-TX), who represents the district that encompasses Big Bend, wrote the resolution to create an international park with Mexico. "This is a very difficult time to be doing this," he says, "but I want to stress that the more communication we have with Mexico the better we will be." For its part, Mexico remains very supportive of the idea of a binational park, says Carlos Sifuentes, who manages Mexico's federal lands opposite Big Bend -- which are nothing like the U.S. national park. "The Mexican government has limited resources to develop its protected areas," Sifuentes says. "Today, across from Big Bend, there are no roads, no stores, no electricity, no water. It's totally remote and wild." There is not yet a detailed plan for a binational peace park. In fact, most lawmakers have not even heard of the idea. Texas Republican Sen. Kay Bailey Hutchison, who has, released a statement saying she would not support any such undertaking that could compromise border security. A National Park Service official in Washington, D.C., speaking on background, said senior levels of the Interior Department and Mexico's Environment and Natural Resources Secretariat have quietly begun discussions on what an international park would entail. He said the mood is more positive than it's been in years -- perhaps because this is one of the few bright spots in otherwise tense border relations.